Here are some testimonials from folks who attended my earlier training sessions. If you're wondering why I'm only posting about this workshop now, it's because I try to give people on my email list a heads up about upcoming training sessions -- usually at least a week before I promote the events on Twitter and this blog. If you'd like to get on that mailing list, just add your name here and I'll send you an email when the next training session is scheduled. 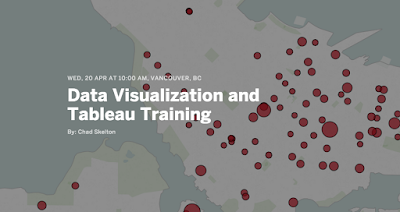 A reminder that I'm also available to do one-day and two-day onsite training if you have a group of people at your organization who you think would benefit from training in Tableau or other data visualization and analysis tools.